Many people think that any hot food must be cooled at room temperature before it is placed in the refrigerator. However, hot food can go in the fridge as long as it is covered and its moisture locked it, according to the US Department of Agriculture. An alternate view, that foods should not be immediately refrigerated to prevent condensation which can lower the fridge's temperature, is offered by the French government. A rapid-chill water bath can prevent condensation and ensure that food is not left out so long as to encourage the bacteria growth. Fill the jug with cold water. Pour the cold water into the shallow pan around the pot. Put in enough water to fill the shallow pan up to its brim. Add ice if you want to expedite the cooling process. Test the temperature of the soup periodically as it cools. You can use a cooking thermometer or taste a little bit of the soup with a spoon. A temperature reading of 100 degrees Fahrenheit will let you know your soup is lukewarm. Divide the soup into several shallow storage containers when it is cool. Cover each of the containers. 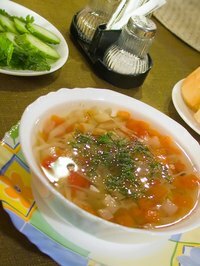 Place the containers of soup into the refrigerator. Soups and stews that contain cooked meat, poultry and fish leftovers can be stored in the fridge for approximately three to four days before spoiling, according to the USDA.